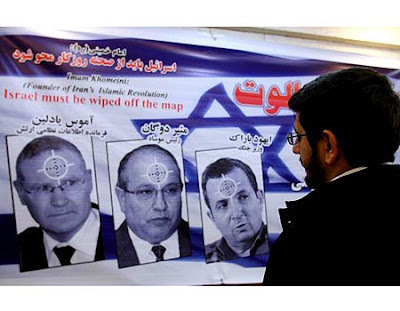 Iranian Hardliner Outs "Scumbag Gateway Pundit"
One of the rare hardliner blogs in Iran (most of the bloggers are more secular in nature, I hear) wrote about his great weekend organizing and participating in a kidney donation drive to raise money to kill Jews. Sarbaz (“Soldier of Roohallah Khomeini”) website, a regime-supporting hardliner website outed “Zionist-loving-scumbag Gateway Pundit” today in a disgusting report applauding the bloody terrorist attack at the Jerusalem seminary last Thursday. Ravazi is very proud that he is a soldier. Ravazi was born in 1981. He is married and holds a Bachelor’s Degree in Electrical rail systems. He was/is attending the University of Science and Technology in Tehran and is working on his masters. Ravasi mentions that the story was published at YNET News, Israel News, Israel Forum and Gateway Pundit– a neoconnish anti-Islamic scumbag website. He also mentions that his kidney signup made the news in United Arab Emirates and Kuwait. –Little does he know how deranged we think he is. ** Much thanks to Banafsheh Zand-Banazzi for the translation!